We offer same day delivery on most orders. Cost of delivery is based on distance and volume; don’t forget to take advantage of our FREE delivery service. We make SPLIT LOAD deliveries of two different materials. We also can set a boulder into your yard or flower bed for a minimal fee. 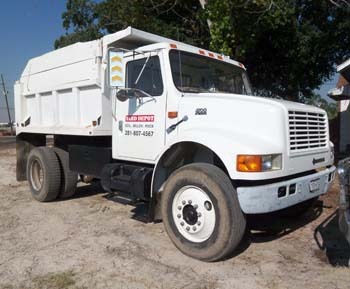 A dump truck will be used to deliver all materials. Materials will be delivered in a designated area. Dump trucks, especially when loaded, may leave ruts in the ground or even become stuck when off-road. A fully cured driveway is the preferred dumping location in most cases. The following guidelines aid in recognizing and controlling some general safety concerns associated with our delivery services. Must be home or leave bucket, cone or sign where to dump. For safety, a driver will not drop materials on the street unless a customer is there. The weight of a typical delivery truck can cause damage to concrete or stone pavement if driven over. Trucks will not drive on new pavement or asphalt. These applications take up to one year to cure and may be damaged by the weight. The operation may also be limited on steep grades. When scheduling a delivery, be sure to let our staff know at the time of scheduling about any power lines, tree limbs, or other overhead objects that could obstruct the movement of the dump truck. The location of septic lines, sprinkler heads, underground drains and utility lines are all important to the capabilities of the truck to drive in certain areas. The delivery truck weight could cause damage to any of these items if present. Be sure to advise our staff or driver of their presence. Always keep pets penned up and children out of the vicinity during the delivery. Drivers are NOT able to see objects in their mirrors that are directly behind the truck. If the ground is wet, it may be difficult for the truck to deliver without damaging grass or landscaping. The Yard Depot may reschedule deliveries because of weather concerns. Be flexible with our drivers. There are many factors that may prevent a product from being placed in a certain area. Drivers’ decisions will be made on the basis of potential safety hazards and property damage. Remember that while we will do our best to satisfy your requests, our first commitment is to the safety of everyone involved. * 1 CUBIC YARD OF MATERIAL WILL COVER 100 SQ. FT. @ 3 INCHES DEEP. * 2000 lbs. of Flagstone @ 1.5″ thick will cover approximately 110 sq. ft.
BOULDER SETTING: We provide service to place big boulders, for a decorative accent to your flowerbed, landscape or around the pool. ~Be aware that driving the Piggyback Forklift over the grass might leave traces in the yard.